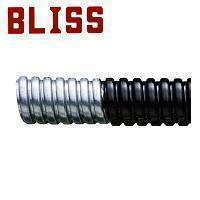 Liquid Tight SUS 316 Stainless Steel Flexible Conduit (Square-locked)(EU Size)(M2017-S6) - Bliss Yih Enterprise Co., Ltd. Stainless steel SS316 core with PVC jacketed. PVC jacket conforms with UL 360 that is flame retardant, oil and sunlight resistant.